The next time your daughter drags her homework lackadaisically to the table and issues an exaggerated sigh as the math drills begin, step away from the flashcards and tell her the story of Malala Yousafzai—the teen who took a bullet, and subsequently won the Nobel Peace Prize, fighting for girls’ right to attend school. 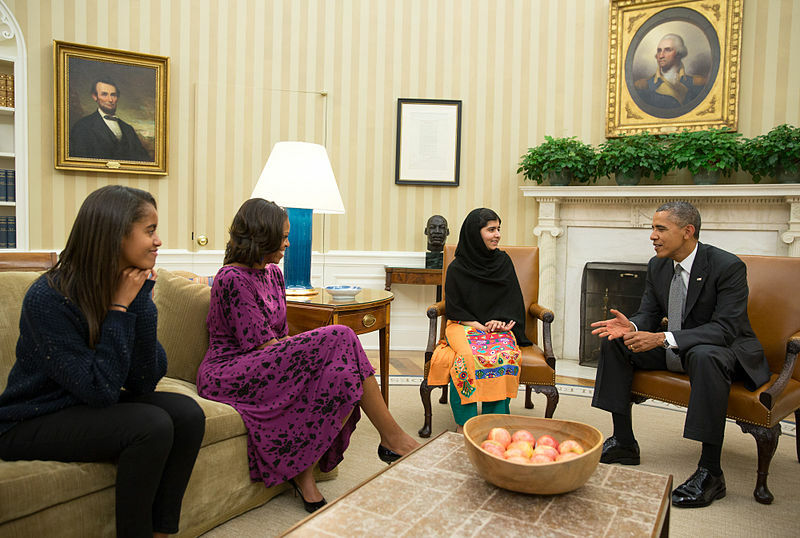 It was two years ago this month, on October 9, 2012, that the then 14-year-old Pakistani girl was targeted by the Taliban and subsequently shot in the head as she rode her bus home from school. Her crime? 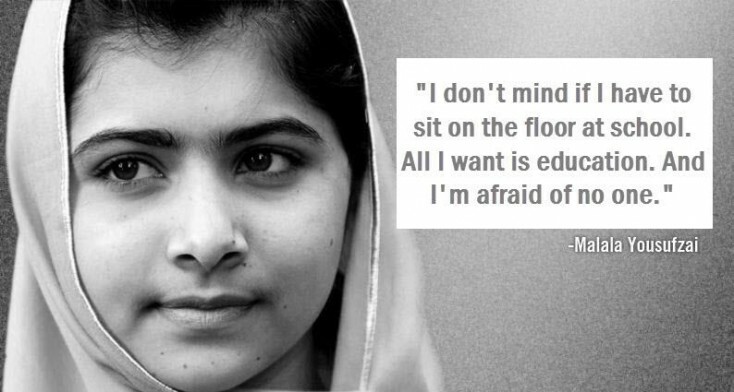 Fighting for the right for girls to attend school and receive an education. In her book, co-written with Christina Lamb, “I Am Malala: The Girl Who Stood Up for Education and was Shot by the Taliban,” she talks about that day. She remembers how it was exam time and school had started an hour later than usual. She mentions her best friend, Moniba, and their shared affinity for Justin Bieber and “Twilight.” She remembers that inside the bus it was “hot and sticky” and how she could only glimpse a small portion of sky through the dirty plastic sheeting that served as windows. When the other children looked in her direction, the man raised his Colt .45 and squeezed off three shots, the first of which struck Malala in her left eye and exited under her left shoulder. The other two bullets found the girls next to her. Though she was 14-years-old when she was injured by a Taliban bullet, Malala had already been campaigning for the right for girls to attend school for four years. According to her biography, as early as 2008, Malala gave her first public speech, titled, “How Dare the Taliban Take Away my Basic Right to Education?” The next year, under an assumed name, she began publicly blogging about her experiences as a young Pakistani girl trying to obtain an education in an area overrun by the Taliban. Though she received death threats and feared for the lives of her father (as well as the rest of her family), Malala refused to stop attending the school she loved. She refused to remain silent to what was happening in her small area of Pakistan. And she refused to be bullied. She intended to become a doctor, and a doctor must have an education. The shooting resulted in a medically-induced coma and multiple surgeries for Malala, but along with horror came notoriety. Upon her recovery, the courageous teen began campaigning even more adamantly, only now she had worldwide recognition lending power to her words. On her 16th birthday, when most teenage girls are preparing for parties and picking out dresses, Malala addressed the United Nations. Later that year, she released her autobiography. You can watch her speech below. Malala was twice nominated for the Nobel Peace Prize, and yesterday, October 10, 2014, she was proclaimed a winner, sharing the prize and the $1 million dollar award with fellow winner Kailash Satyarthi, of India. According to Janet Raloff, writing for Student Science, the two received recognition “for their struggle against the oppression of young people and children’s right to education.” Malala will be 17 years old when she accepts the award – the youngest person ever to receive the Nobel Prize for Peace. It will be presented on December 10, 2014, in Oslo, Norway. This article was written by Anne Goetz, Anne is a current contributor to the The San Francisco Chronicle, The Houston Chronicle, Global Post, Livestrong, ModernMom, Society6 and several other publications. She freelances as a ghostwriter, advertising copywriter and blogger.